My first garden on our new homestead. No time to do anything more than till the worn out soil and plant. It was unusually hot and dry. There were more grasshoppers per square foot than blades of grass. They enjoyed my gardening endeavors. But in spite of it all, incredibly, we harvested more than a few handfuls of snap beans and green peas. I was hooked. And if you think beans are boring, check out the dry beans offered by the independent seed companies. If that's not enough, the last I looked the Seed Savers Exchange had listed some 600 varieties of beans in their annual Yearbook. No reason not to have fun with your bean soup. It is interesting how the weather and our lives change. In years past I would be happy to get a good harvest of dry beans 3 out of 5 years, the others being too cold, too short season, too many summer frosts for a crop. But that was many years ago. Now I often skip a year or two because I have plenty of dried beans. Maybe we're not eating as many now; I'm not sure. But I still like to grow them, just not so many and not so many different varieties. This year just five, plus a few snaps (still the old Black Valentine and Long White). My main and favorite dry bean is Yellow Eye, Maine. By selecting the earliest and best for seed over decades I've come to have a reliable Yellow Eye crop (which it wasn't in the early years). We love the flavor of this bean. It cooks up quickly into a wonderful bean soup. The medium-small round white beans with the yellow eye (naturally!) is a pretty bean as well. I added Marfax, a small round brown bean like Swedish Brown, a few years ago and it has done well. It's a sturdier bean when cooked so nice for chili or baked beans. I've continued to grow Black Turtle (Turtle Drum #23) off an on, originally a highly variable landrace from Wisconsin it stabilized over the years. It is usually one of the highest yielding beans but I find I don't reach for it very often to cook. So I might discontinue this one. My other two varieties started out as sports in my Swedish Brown crop twenty-one years ago (see article below, 1995). I continued growing and selecting and ended up with these two nice varieties, now stabilized. One is a medium oblong white with a red eye and the other a somewhat larger medium maroon splashed tan bean. The latter coloring pattern seems to be a common throw-back pattern that shows up now and then in many beans. I've grown my beans for years four rows in a 4 ft bed (about 8" apart) with in-row spacing of 5" and that continues to work for me. Planting usually is the first week in June; harvest in September when the beans/pods are mature and dry. I like to harvest just the pods on a sunny day, going down the row plant by plant, sitting on the dry mulch, enjoying the crunchiness and smell of the fall-dry hay, picking the dry pods into a paper bag or basket, one variety at a time. It's a zen type harvest, unless I'm trying to beat a coming rain. If it's a damp fall then the bags or baskets of pods go into the greenhouse (no plants in there yet) to finish drying, or they find a spot out of the way in the house until they are well dried and I have time and inclination to thresh them. Next to screen and winnow away the pods and trash and enjoy the beauty of a bucket of smooth, shiny beans. Later yet, usually when fall is giving way to winter, I sit down and sort through the harvest to pick out any damaged or immature beans, pouring out a layer at a time into a glass cake-pan. Another sort to set aside the very best looking for next year's seeds and they are all stored away for future meals and future crops. A good and satisfying harvest. For a number of years I'd planted a mix of the many varieties of dry beans that I'd been growing (twenty at one count). It was easier, and I'd been mixing them for cooking anyway. Easier yes, but it didn't work all that well as many varieties cook at different rates. Plus I got to wondering how the different varieties were doing yield wise. So last year I sorted the varieties and planted them separately. Then chose the best to plant this year; again saving the best yielders to plant next year. I've decided I don't need twenty varieties of dry beans! I'm now down to seven, plus two snap beans -- the venerable, and very reliable, Black Valentine, and a long flat good yielding green snap (maybe Greencrop?) given to me by a gardener in Minnesota whose mother has grown them for years but doesn't remember the name (she got the seed from a neighbor who had grown them for years). Plus I have an array of colors from a Black Valentine sport from several years ago. They're just too much fun to not grow out, besides which they've turned out to be good yielders for dry beans as well as for snaps. This year reminded me again why I grow my own and select for my own climate. After a number of unusually hot (and dry) summers, and equally unusual bean yields, we were back to our more "normal" cool upper Midwest summer. The dry beans made it, barely, and the overall yield was back to what I'd been used to. 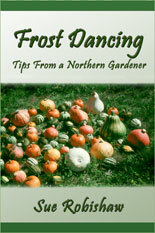 The beans may not have been that crazy about the cooler weather, but we northern blooded gardeners sure were. I tried spacing my bean plants at 7" apart this year instead of my usual 5". The plot they were in is one of my worst for fertility (sifty sandy soil) and it appeared we might have another hot, dry year (we did). It was a tough year for all of the garden plants but the beans did OK. Quite a few yellow leaves, a smaller yield probably, but not a bad crop. But the larger spacing wasn't so good. The plants were too far apart to hold each other up. Back to 5" next year. This was the year for DRY BEANS -- one of my best harvests ever. A very good year, with most of the pods dry and ready for harvest the first of September. I had planted some in the north shade of an apple tree and they were definitely later maturing. They need to be out in the full sun. This hot dry summer had to be good for something! I had a rough time keeping up with the harvest of my SNAP BEANS this year. A problem I can live with. I continue to be enthused with the old timey Black Valentine bush bean, and the Valentine Red is pretty good, too. They keep us in snap beans all summer and manage to mature a good enough amount for seed next year. I also like the Uncle Tom’s, though they’re a bit smaller and not as prolific. But they’re a good companion to the others and I have to love the name -- my Dad was a loved and favorite Uncle Tom to many of my cousins. SHORT SEASON DRY BEAN -- I've grown maybe a hundred different varieties of dry beans over the years and the consistent winner for short season is the Jacobs Cattle. It is one of the more common heirloom beans available -- great tasting too. It also takes less time to cook than most other beans. You'll do best getting your seed from a grower with similar growing conditions as your own. A BEAN IS A BEAN . . . or, are looks only skin deep. In this case, bean skin. My garden beds are about 4 feet wide and I’ve planted four rows and five rows of beans per plot. But I’d never noted if there was a difference in yields. A note from Larissa prompted me to do a test plot this past summer. She said, "We plant bush beans four rows per 3.5 foot wide bed, with an Earthway Seeder, and the pole beans are planted in a double row with a trellis. The slightly wider spacing has increased our yields per plant (same yield per plant with less density), probably because our garden gets a heavy dew every evening even in a dry year. Even with the increased air circulation from a slightly wider spacing, we still have to pull the plants to finish drying the pods in a shed. Pole beans are very much worth the extra effort of trellising when harvest time rolls around – cleaner beans and easy to pick." She also noted that though her 1993 yields were equal to mine, they usually get twice that much. I did another Jacobs Cattle test as well. Kathy from Minnesota sent me some of her JC seed. She had been raising the seed four years and it had been grown by another gardener in Minnesota for twenty or so years before that. My seed had originally come from Johnnys Seeds about ten years ago (1984), I’ve been saving my own since. I planted her seed in a plot next to my seed. The size, color, and markings of both JCs were similar. However, while the yield from my seed was 8 oz/10 ft row, the yield from her seed was 14 oz! Quite a difference. By the way, both Larissa and Kathy have longer growing seasons than I do. (2008 note -- the next year I again planted both JC's side by side, but this time Kathy's seed was decimated by mold while mine had little. A good demonstration of the positive effect of continual selection and acclimation in our own gardens). This summer I also traded seed with a gardener from downstate (Michigan). He sent me some of his Jacobs Cattle and I’m looking forward to seeing how they do in my garden. His were of a deeper color than mine, as were the Yellow Eye he sent. I have noticed sometimes significant changes in color of bean seed I receive when I plant and harvest them in my garden. Also, a difference year to year sometimes. I assume this has to do with weather and soil. That would be an interesting experiment as well. Bringing into our gardens the same variety of seed but grown in different areas could be a good way to strengthen the genetic diversity in our crops, assuming, of course, that the seed is of equal or better vigor in our particular garden. Several years of side by side trial before mixing the seed would be a good idea. But I’m not going to throw out my own JCs and replace them completely with Kathy’s (see note above) just because the yield is higher this one year. Mine are well acclimated to my garden, as are her seed to hers. I think the new blood mixed in might be good, but I also want to keep that line of my own that has struggled and made it through some very tough, cold years here. That closeness and attention to individual herds throughout generations is what has made these Cattle survive and thrive for so long. It’s a good feeling to be continuing that, not to mention some very good eating. Getting my dry beans threshed and cleaned seems sometimes overwhelming, especially in a good year. But this year the work was more than worth it, not only for the beans to eat and for seed, but for the surprises. I had more sports and shifts and mutants and variations than I've ever had. I think due in large part to the weather and to the number of landraces and rather unstable varieties I had planted, as well as some true genetic shifts or sports. Crosses generally aren't common in regular beans. In an interview printed in the "Seed Savers Exchange - The First Ten Years", John Withee (who brought his collection of 185 samples of beans to the Seed Savers Exchange) talks of crosses or sports and what he learned from Prof. Meador. He says that crosses can occur but that it is more often a genetic shift than a real cross. When the sport is planted the results are variable. If you keep planting and can keep the different set of characteristics stable through three generations then you can call it a new variety and name it. But it also may revert back later grown somewhere else or with different weather. Whatever the reasons, it adds a bit of fun and adventure to bean growing. Last year Larisa wrote about several sports they discovered and grew. "For 2 yrs previously I'd noticed a single "mutant" plant appearing in our Roark pole beans (normally pinto looking). The plants had round, striped pods with shiny black seeds. This last season  1 planted a 30' trellis with the mutants I'd saved from those two plants. What a surprise when it came time for harvest. There were black pole beans, but some had striped pods and some were plain. And there was a whole rainbow of other colors - gray w/pink rose eye, tiny brown, brown mottled, tan & black speckled, etc. I picked out four of the variations that had pod types I prefer & that seemed the most abundant in the patch to plant out separately in '95. 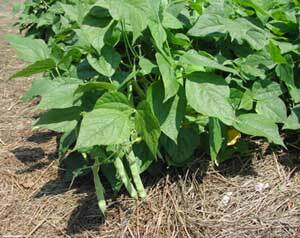 We also had some surprises in the Arikara Yellow bush beans. Three new colors popped up." [a somewhat smaller goldbrown, a somewhat smaller mottled dark brown, and a mottled light goldbrown]. I haven't heard yet what happened in Larisa and Bob's bean patch the next year but it probably wasn't boring. Last year I found six dark brown beans in my yellowish tan Azores beans, which I planted this year. Each plant produced a different crop of beans, all similar size and shape of various shades of brown, gold and beige with one brown eyed white. Another shift I found this year was more dramatic. Several years ago one of the main participators of the Seed Savers Exchange introduced a number of beans collected by the Teaching Drum School in Wisconsin from various Native American Sources. Most of the beans are unstable landraces and I have found a lot of variety in the ones that I've grown. But in the Teaching Drum#24 this year I had four plants that appear to be sports. The regular crop are either shiny black med-small or black/tan mottled med beans. The mutants were: all white med-small, black/tan mottled med-large, half white half black w/dk gold splash, and third white two thirds gold-brown/tan mottled. Maybe the most surprising were changes in two old standbys Swedish Brown and Soldier white kidney. I've been saving these beans for probably 10 yrs. The Swedish Brown are always a consistent crop of small roundish gold (particularly good flavored) bean. This year maybe a third of the beans were larger, oblong and a beautiful maroon gold marbled color. And the Soldier beans had the largest, darkest red "soldier eyes" I've ever had with a good portion of them very large and a mottled red with extra spots across the white bean. A few had a brownish and gold mottled soldier eye. Since these changes were widespread through the crop I assume they are weather related instead of sports or crosses. It will be interesting to see next year what happens with these and all the other variations that occurred this year, in my garden and in yours. 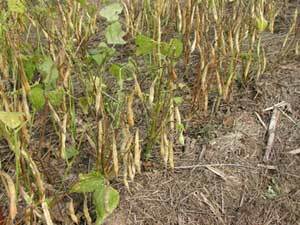 An additional bean note: growing beans in short season areas means often having a, sometimes large, number of not mature or dried-down pods and beans when harvest time rolls around. This year as I picked mature pods I also harvested all those that were at least past the green stage into a separate basket before hard freeze. These sat in the greenhouse or by the fire for some weeks to dry. When they were threshed out I found a large harvest of edible dry beans. Some were paler than their mature siblings but that won't matter in the bean pot. And many were more mature than I thought they would be. Certainly a pleasant end of season surprise. It was a hot, sunny day as we stood just inside the stockade wall of the White Oak Fur Post discussing the crops. The beans still had plenty of pods to offer even though Broken Toe had been harvesting them steadily for the soup. The cast iron pot was large, the fire hot, and the mouths to feed many. As I considered the great number of people rendezvousing at the Post I wondered if there would be any beans left to mature for seed for next year. The corn would soon be ready. The new potatoes were already feeding the folks and the squash were well on their way to a good harvest in the fall. Mr. Cotton, one of the bourgeois of the Post, was telling me of the garden and the work that had gone into making it a success this year. The previous year they had lost much of their crop, and consequently seed, due to heavy rains. This year they had hauled in dirt to raise the area. (The success of which was seen (heard) in the satisfied, happy slurping rather loudly commencing around Broken Toe's kettle a few evenings ago as the crowd eagerly partook of her new potatoes and peas). Mr. Cotton consulted a piece of birch bark in his hand as he satisfied my inquiry as to the names of the varieties growing in the garden: Mandan corn and a northern white flint corn, Arikara Squash, Jacobs Cattle bean and one of another name (I, unfortunately, did not take his cue and write down the names). Chickweed and lambs quarters, along with other "wild" crops, were interspersed. There were a few blank spots as the lettuce didn't come up, and the cabbage had been mowed down earlier by an over enthusiastic volunteer with a too efficient lawn mower. They had lawn mowers in 1798? Oh, yes, I forgot, it was actually 1995. And I was glad I was a simple, working-class woman traveling and working with her itinerant woodworker husband. Dress of worn cotton skirt and shirt, and bare or moccasined feet seemed a lot more suited to this unusually hot weather than my companion's bourgeois outfit of wool with frills and frippery, waistcoast and whatknots, fancy shoes and long stocking. The heat and clothing did not diminish his kindness, however, in sharing his garden with me (the kindness and friendliness extended, I might add, to all the staff and workers at the Post). Finding the familiar Jacobs Cattle in the garden made me feel quite at home. While we were discussing the garden a woman approached and said that to be historically correct they should have pole beans instead of bush beans in the garden. I wonder at that though. The Jacobs Cattle bean has been around for a long time and I haven't seen any reference to it previously being a pole bean. And a perusal of the bush dry bean section of the Seed Savers Exchange Yearbook indicates many bush beans have long histories. In my own garden I have found few pole beans that will even begin to mature in my short season (which is probably similar to that at White Oak, near Deer River, Minn.). As with corn (and tomatoes) successful beans seem to be shorter as the growing season shortens. It could be that the short season pole beans have been lost, as has much of the short season corn, or I haven't found them yet. The writings available from the Old Northwest territory time period are frustratingly short on good descriptions of gardens and crops of that time. And a pole bean may have changed to a bush type over time through selection or sport. There are many varieties where the distinction as to pole or bush is not very distinct with various runner lengths. Or as likely, then as now, some folks grew pole varieties, some bush. And it would depend on how you wanted to grow them also. A bean planted to grow up a northern short season corn needs to match the shorter sized stalks. Up a pole it could be taller and more aggressive, by itself a shorter plant would be preferred. A mismatched corn/bean combination isn't good. I planted a cornfield bean sample near four corn plants this year. It wasn't a fair fight. By late summer the bean vines had their own corn stalks wrestled almost to the ground and were reaching out to others nearby. The corn did produce ears (the beans on the other hand didn't mature) but I don't think it was the way they would have chosen to grow. I have planted squash among my corn in the past with similar though more far reaching and jungle thick results. I now keep the three separate. Any insight or comments or opinions on the bean question? Beans were in the northern Midwest at least as far back as the mid 1600's and probably before. But what were they like? Color, plant size, taste, shape, days to maturity? What aspects of our beans today did they find in their's of yesterday? Or will be found in the beans of tomorrow? Savers of a particular seed are connected to past and future seed savers in a very practical way, those of the future cannot be without those of the past. Standing on the (recreated) site of the gardens of the White Oak Fur Trade Post of 1798, and living that era, brought that connection to a new reality. Were the Jacobs Cattle beans planted there, and the Jacob s Cattle beans planted in my garden 500 miles to the east, related by blood to a bean planted, and saved, 200 years ago? It was nice to see the garden included in the recreated Fur post. If there is an historic site near you where a garden would be appropriate consider encouraging the planting by helping out. There may not be anyone involved who is familiar with heirloom crops and seed sources, or they may need some additional hands. And there is no charge for the fun and satisfaction. (For more information on the White Oak Society and Fur Post events contact them at PO Box 306, Deer River, Minn. 56636).